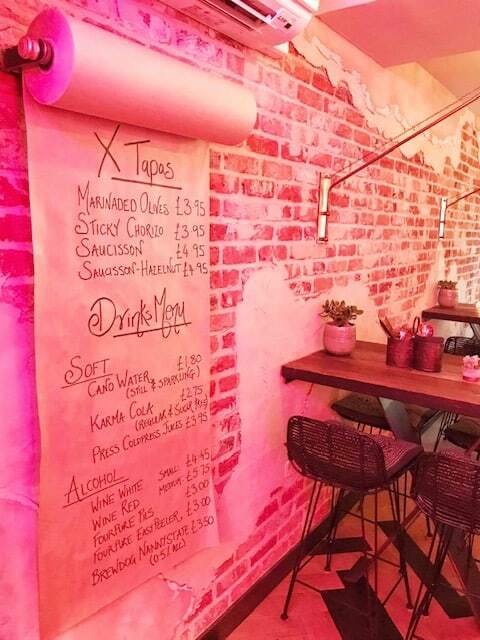 The new kid on the block, X-Upper, opened it’s doors offering gourmet sausages in London on Upper Street, Islington. What a fabulous addition to the much loved street, home to many bars and restaurants. 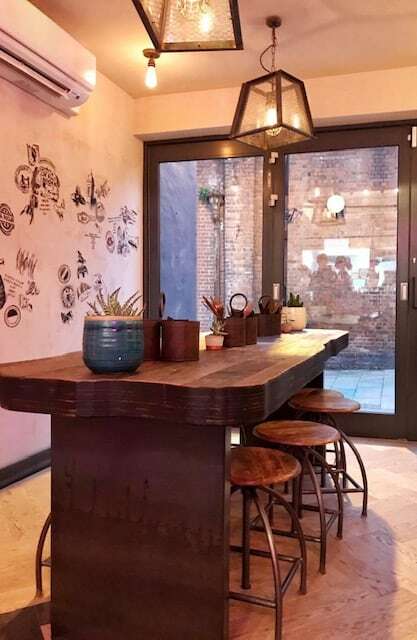 This fantastic little rustic-looking restaurant brings Londoners the best gourmet sausages from across Europe. The brains behind the restaurant travelled to 14 different cities across Europe trying hundreds of varieties of sausages to find the best. So far they have chosen their favourite six to add to their menu, from the English Cumberland to the Italian Romagna from Bologna, Italy! These guys want to create a sausage revolution, using a hashtag of #forgetwhatyouknow. They are creating delicious recipes, very far removed from the typical “hot dog”. They certainly mean business and just by the presentation alone, they are on to something unique and special! With everything looking extremely delicious, it was hard for us to choose from the menu. 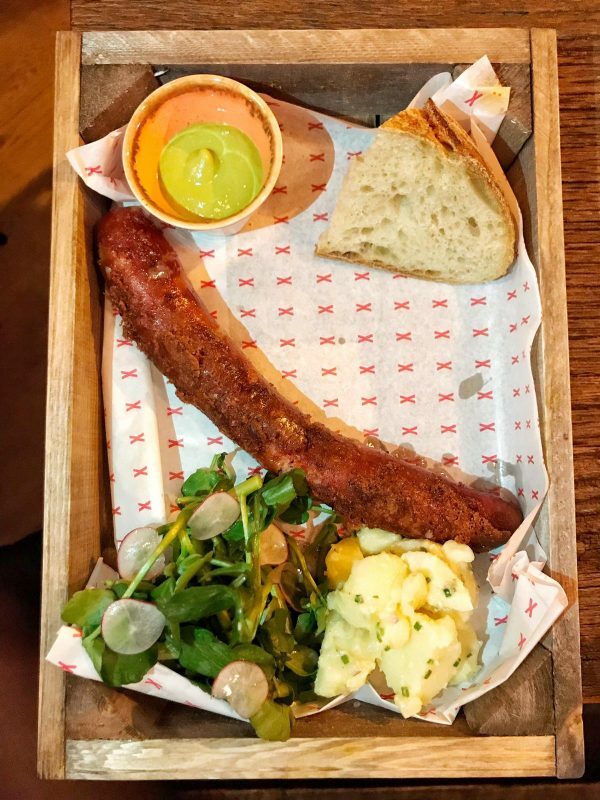 We opted for the restaurant’s current best seller, The KK: Kasekrainer – pork and beef sausage smoked over beech wood, served with green mustard, watercress salad, and authentic potato salad (£9.25). 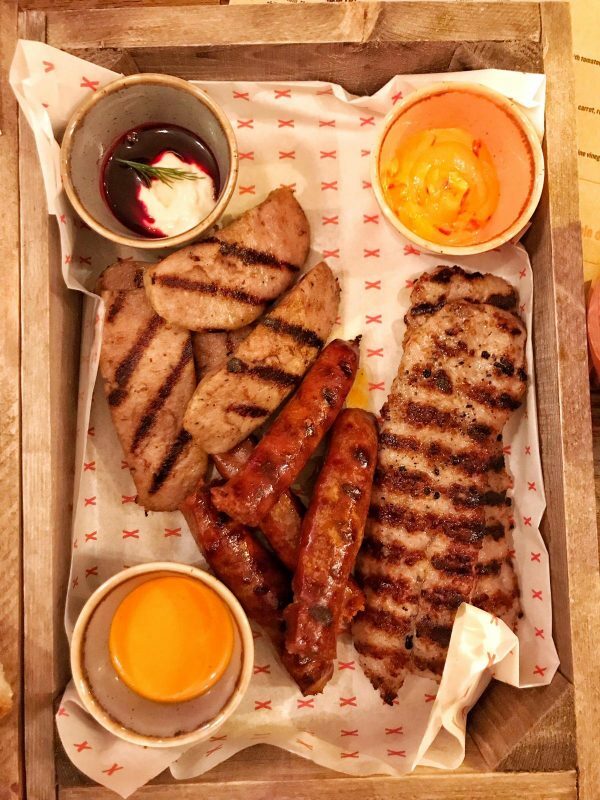 We also could not resist the sharing platter, The X Sampler consisting of the Cumberland, Skinny Chick and Merguez sausages, accompanied by grilled slices of bread, a house salad and 3 different sauces (£26). These dishes were fantastic. The food all came in cute wooden boxes and each sausage burst with different flavours. X-Upper also offer a vegetarian option and are looking at making a vegan option too. It was great how these sausages ditched the traditional sausage bun and opted for healthy salads, and quality bread as accompaniments. 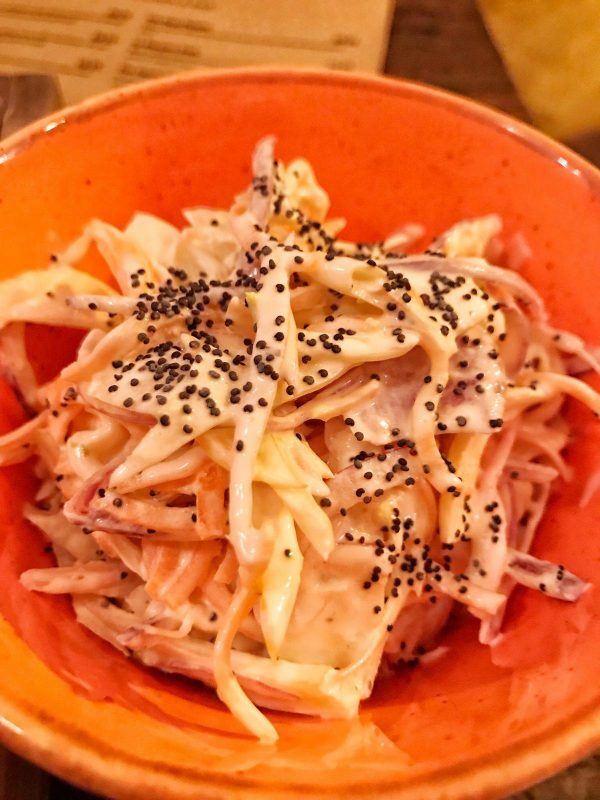 We also tried their Signature Slaw (£2.95) which is a big enough portion for two people to share. They use crème fraiche instead of mayo which was an absolute winner! Another thing we love about this place is their desire to work with local companies. They have teamed up with nearby brewery, FourPure to serve two different beers. The FourPure Easy Peeler IPA (£3) was really citrusy. They also have some wines to choose from, along with soft drinks and four different cocktails. 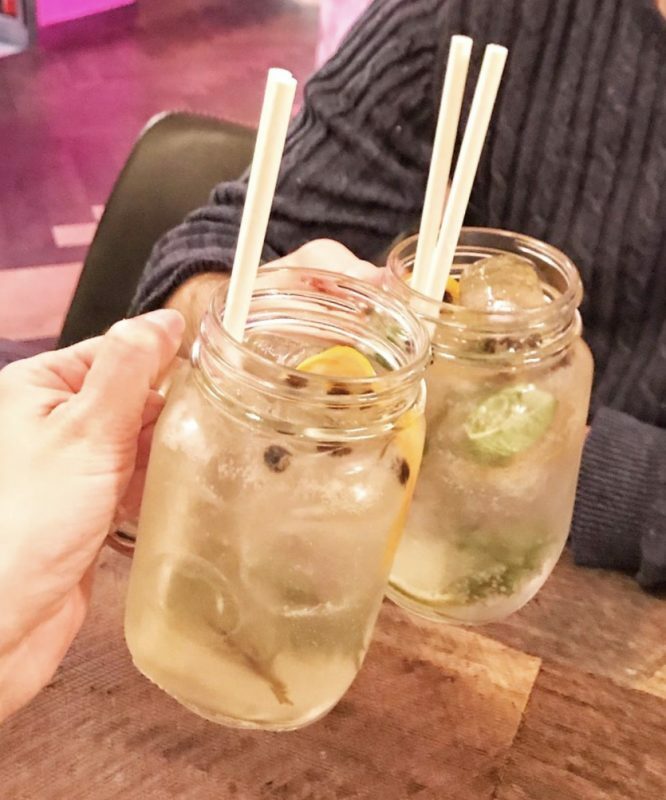 We tried the Hugo and the Rosemary’s Bay cocktails which were divine so refreshing (£7.50). 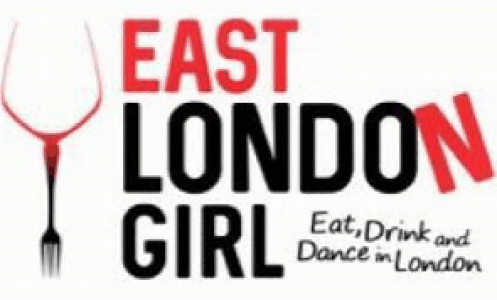 With so many restaurants popping up all over London, you have to stand out. X-Upper offer something different and it was great to see the passion from the creators. They really do offer some of the best gourmet sausages in London!